Smarties love hearts. 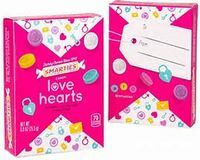 You can now buy Smarties Love Hearts in boxes perfect for your Valentine Exchange. Everyone loves smarts candies and these love hearts are no different. Sweet and tart flavors all in one bite. Not only do these love hearts have cute sayings of love, but new says have been added for this year. Text me,Swipe right, BAE (Before Anyone Else), On Fleek and �YOLO� are among the sayings being added. These updated messages reflect today�s romantics. Perfect for your Valentine Exchange. You get 4 boxes per pack , there is even a spot to write to and from on , so your Valentine knows who is sweet on them.